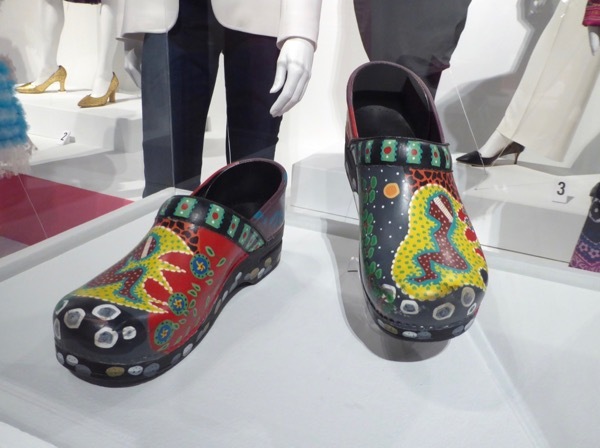 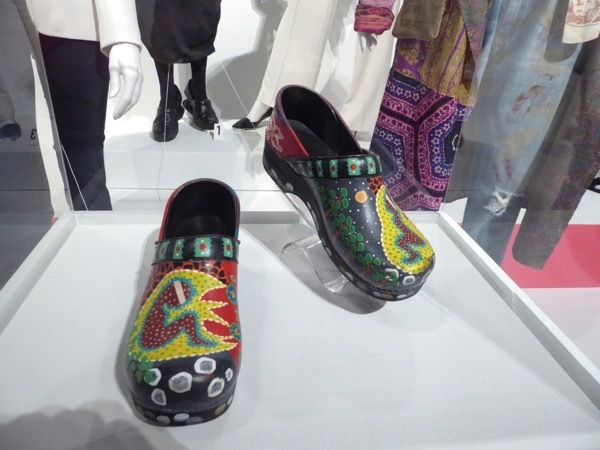 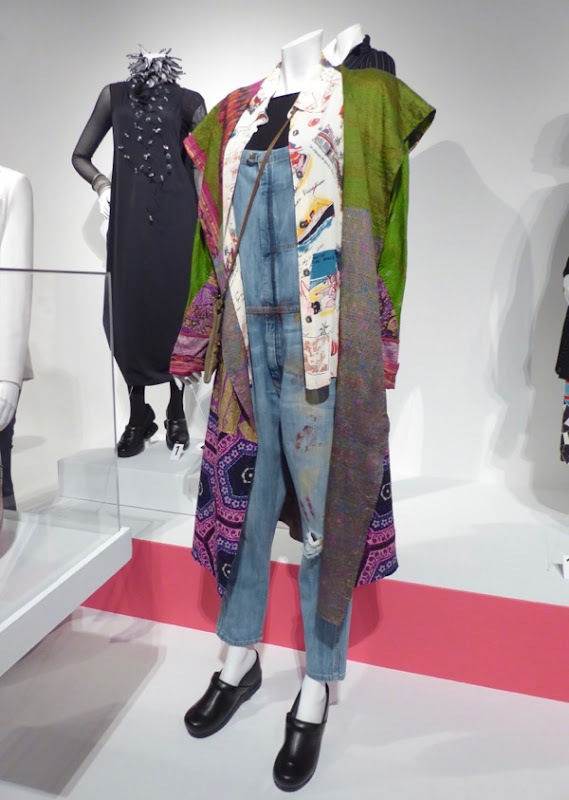 With the fourth season of their Netflix comedy imminent, it seemed timely to share these fab third season costume worn by Lily Tomlin and Jane Fonda in Grace & Frankie. 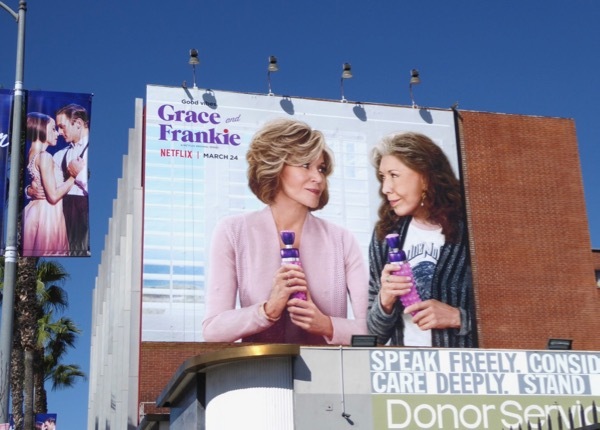 In the series the two 9 to 5 actresses play women whose husbands came out as gay and left them late in life, for each other, and the hippy artist and successful businesswoman went from frenemies to best friends living together and finding a new lease of life. 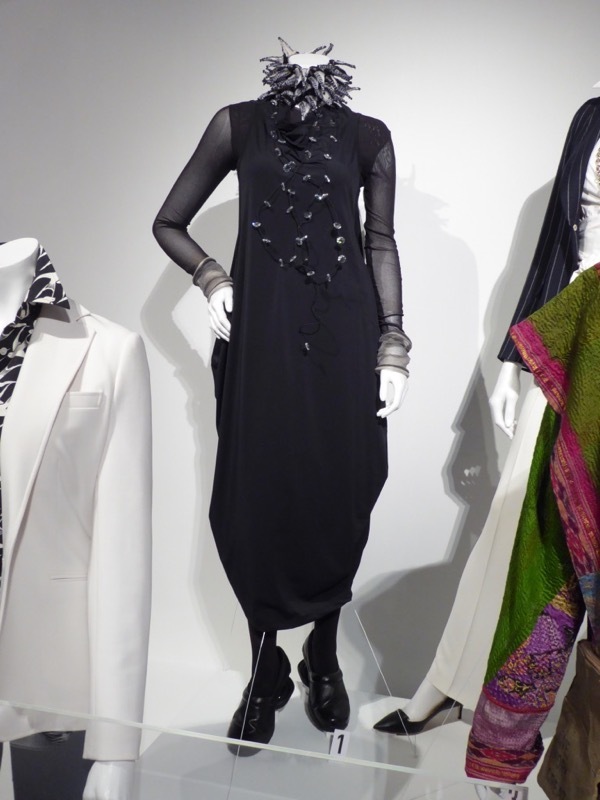 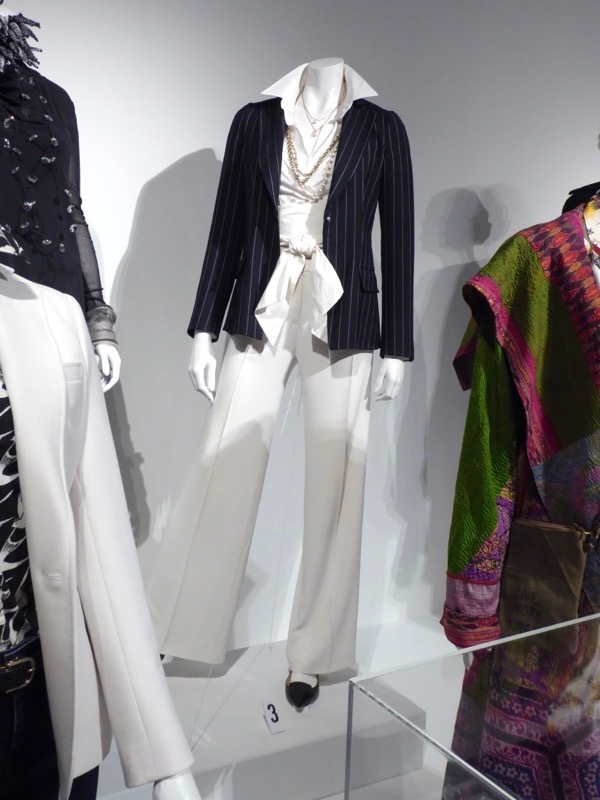 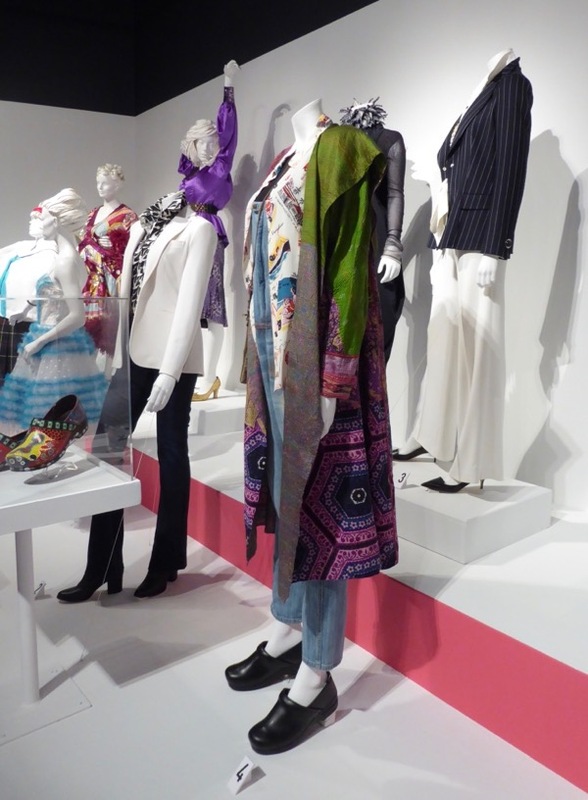 These costumes worn by Jane Fonda as 'Grace Hanson' and Lily Tomlin as 'Frankie Bergstein' were photographed on display at Downtown L.A.'s FIDM Museum on August 23, 2017, part of the 11th Outstanding Art of Television Costume Design exhibition. 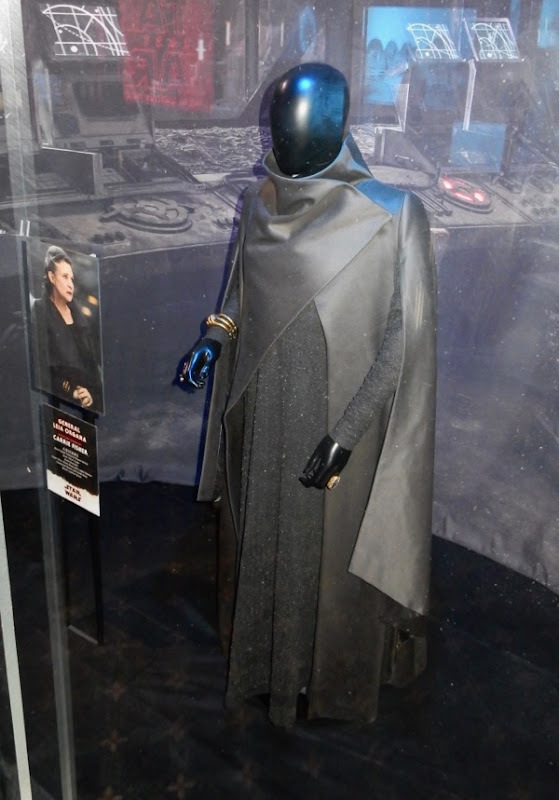 Allyson B. Fanger was the Emmy-nominated Costume Designer on the season with Assistant Costume Designer Heather Pain and Costume Supervisor Lori DeLapp. 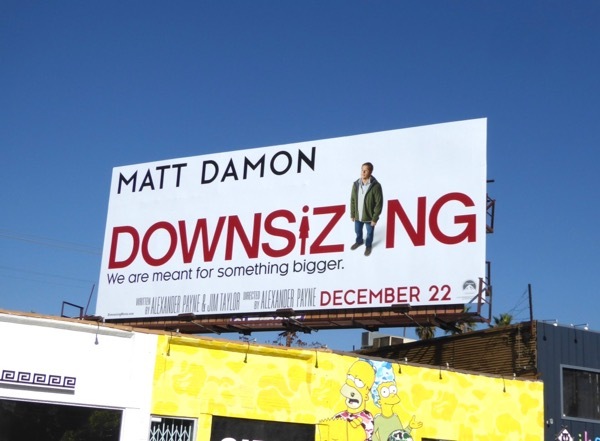 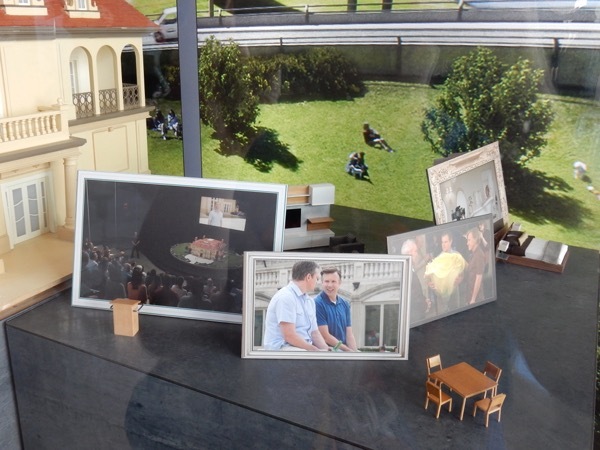 In Alexander Payne's new movie Downsizing, scientists have begun to shrink people to four inches tall to deal with overpopulation and Matt Damon's 'Paul Safranek' and his wife (played by Kristen Wiig) decide to start anew in a downsized community, but at the last minute she can't do it, leaving him to begin this life-changing journey by himself. 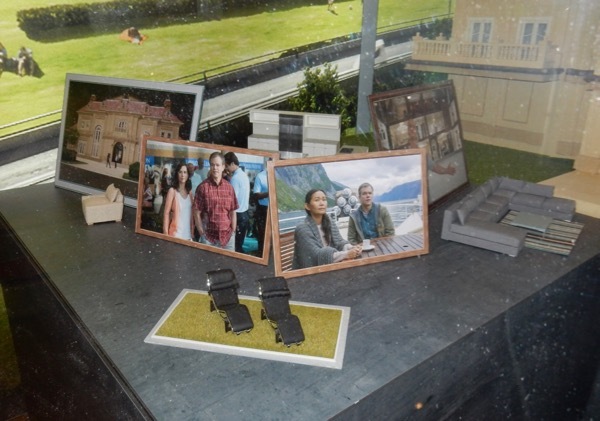 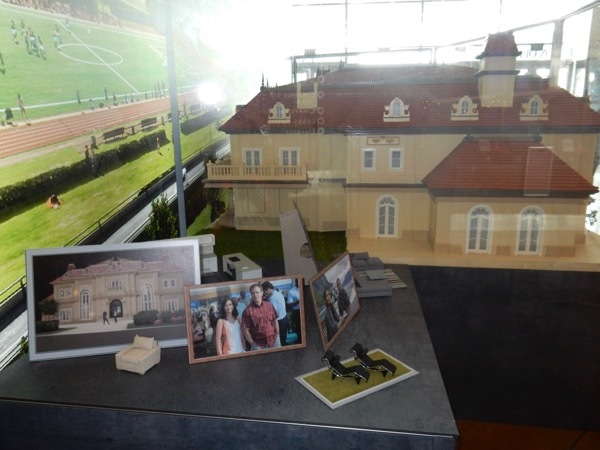 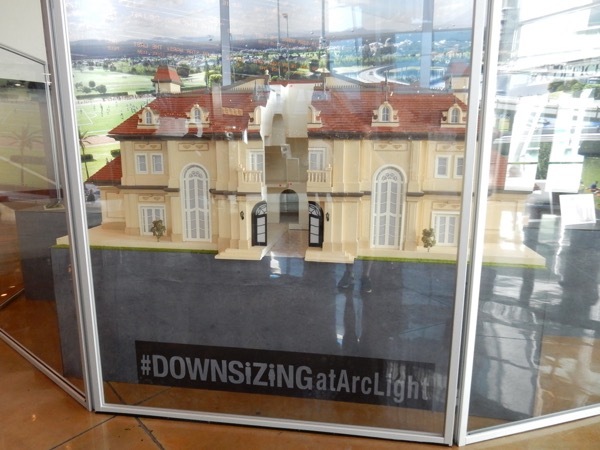 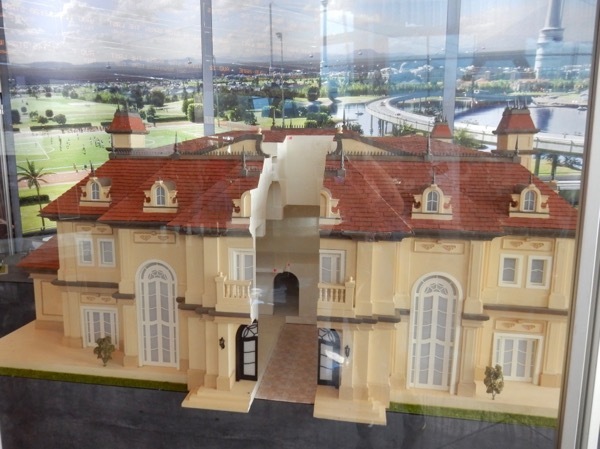 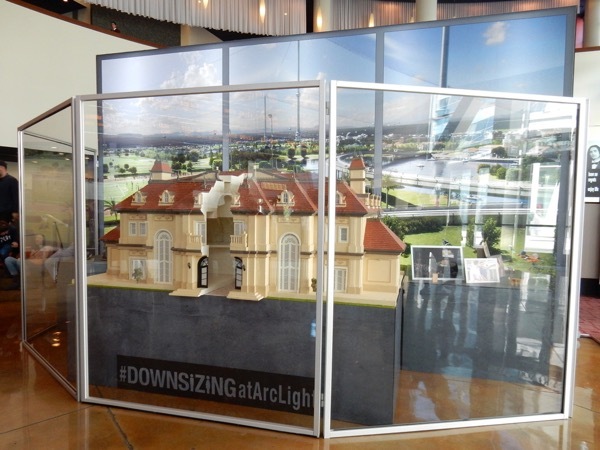 This miniature mansion model and furniture pieces from the movie, a bit like a giant doll house, were photographed on display in ArcLight Hollywood cinema's foyer on December 15, 2017. 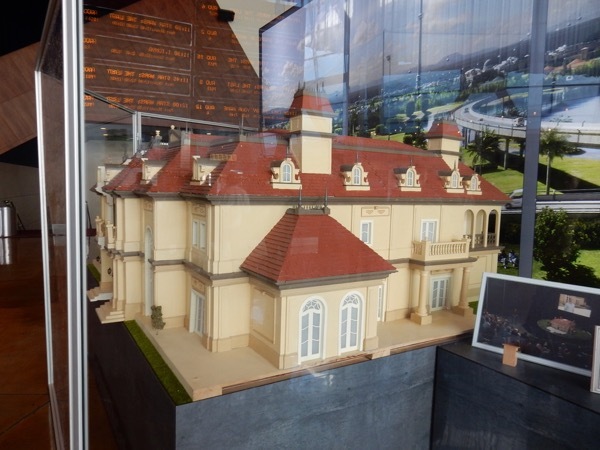 It's always cool seeing models and props that help bring a movie to life, and if you like this example be sure to also check out this miniature model of The Grand Budapest Hotel, which was truly amazing to behold in person. 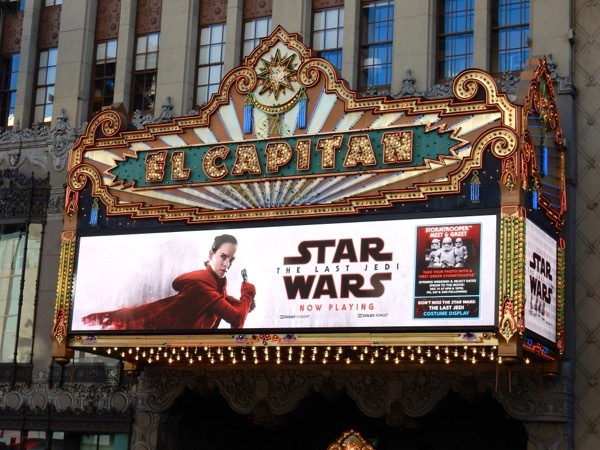 Star Wars: The Last Jedi is finally here and it's spectacular. 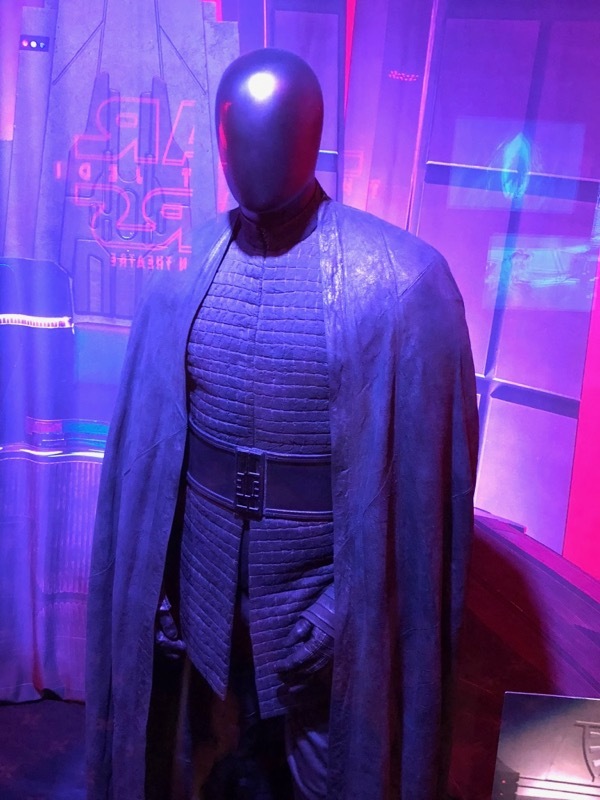 In director Rian Johnson's latest installment in the film franchise from a galaxy far, far away the Resistance flees from 'Supreme Leader Snoke's' First Order, whilst Force-strong 'Rey' hopes to enlist Jedi Master 'Luke Skywalker' to their cause and 'Kylo Ren' continues to question his loyalties to the dark side. 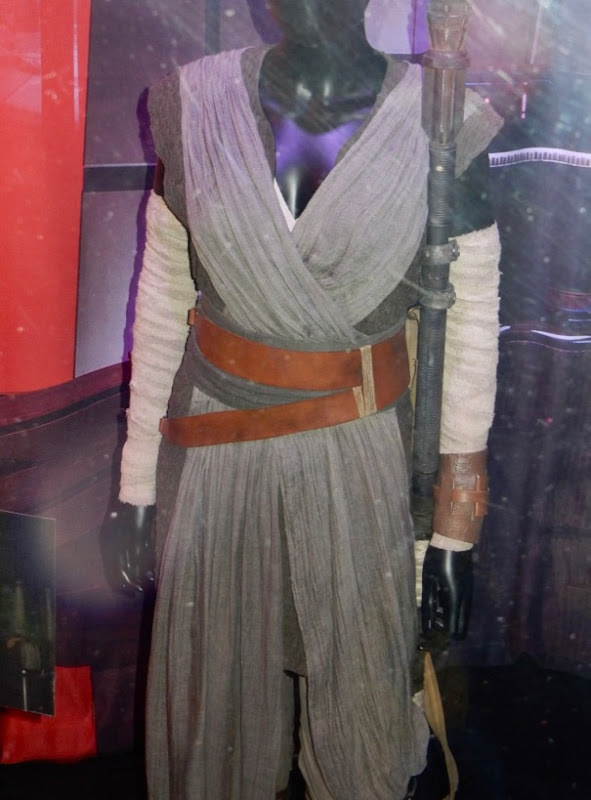 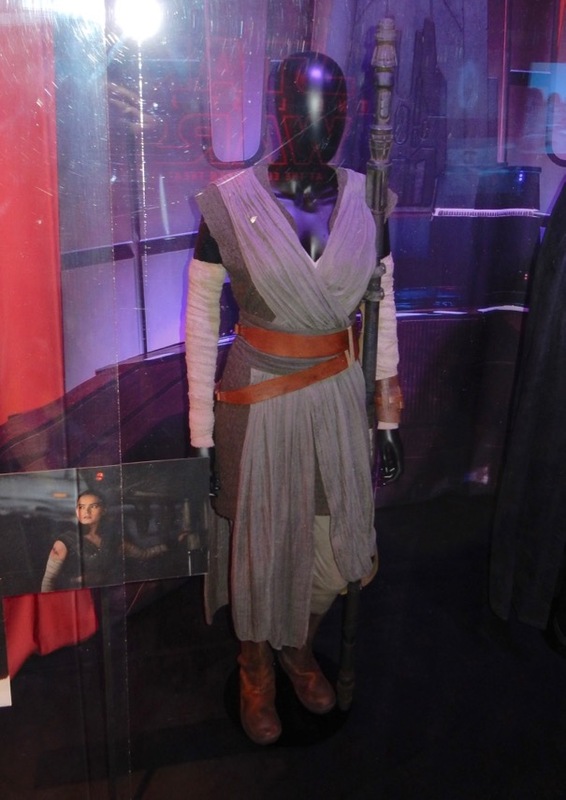 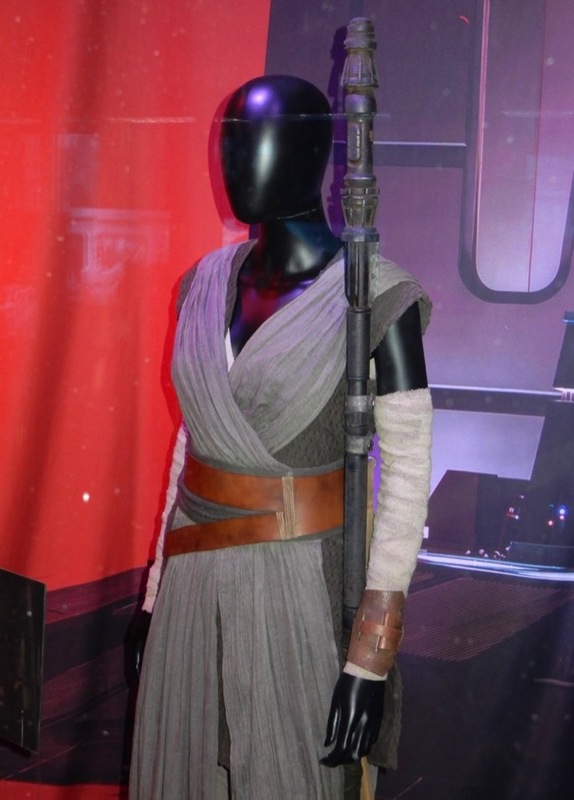 Daisy Ridley's Rey sports several similar looks in the film, but wears this version when she faces Snoke. 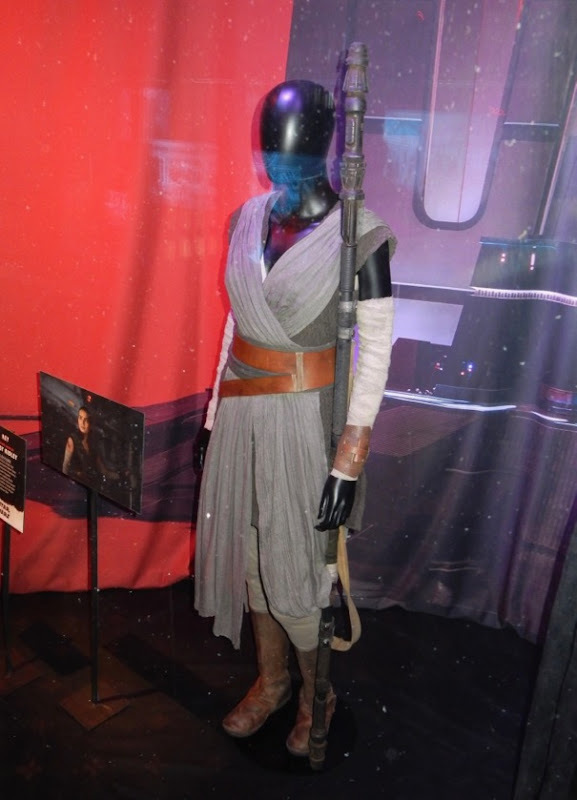 The costume consists of a light ecru jersey top, brown textured cotton tunic, taupe crossover wrap dress, taupe trousers, light stone arm wraps, brown obi and brown leather boots, wrist guard and holster belt. 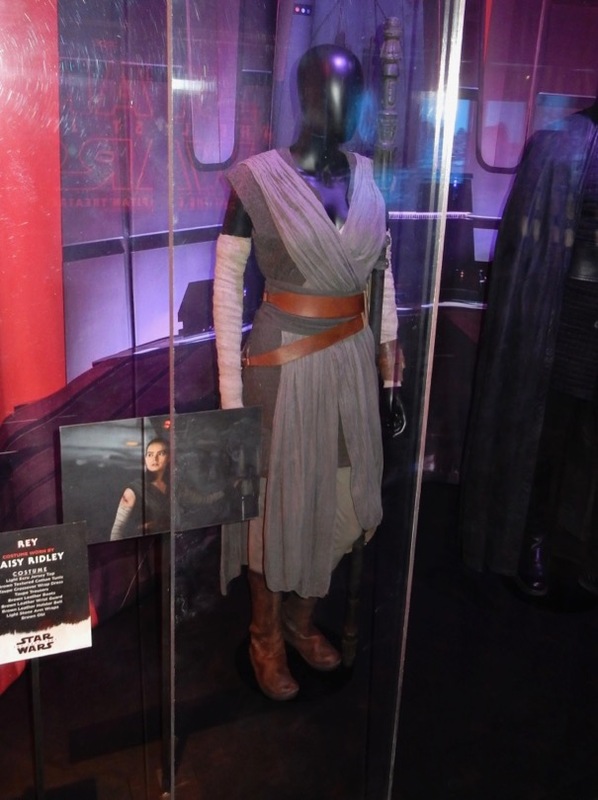 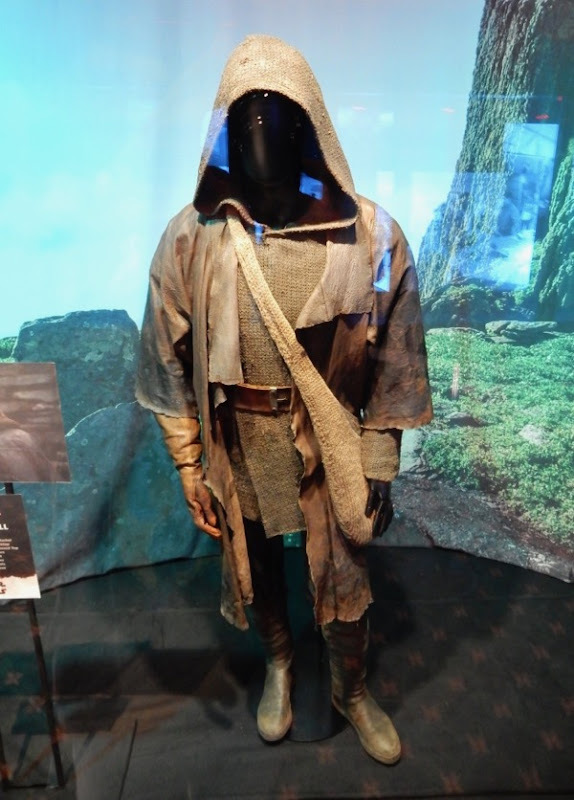 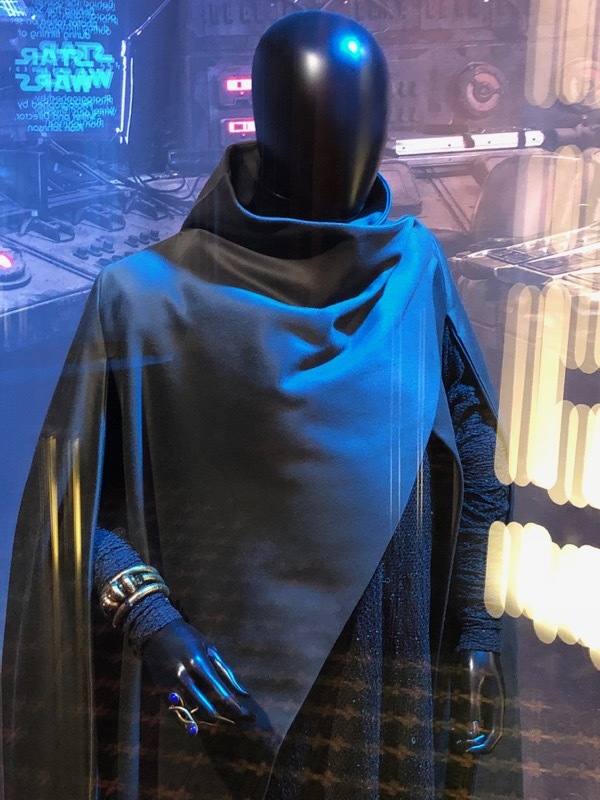 Michael Kaplan is once again Costume Designer on this episode and you can also compare this new outfit to Rey's Jakku scavenger costume from The Force Awakens, plus be sure to also check out Finn and Captain Phasma's costumes from The Last Jedi on display. 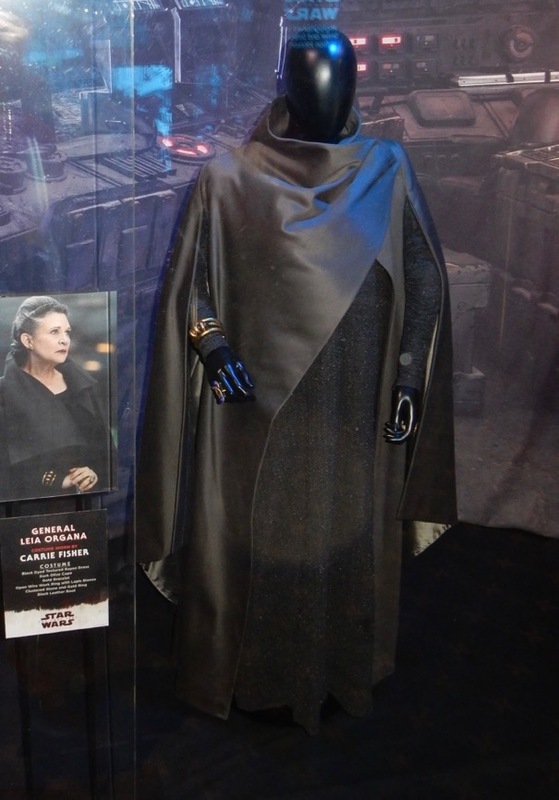 Not only does 'General Leia Organa' gets more screen time in this movie, but she also looks far more regal, befitting her princess heritage, in Carrie Fisher's final performance. 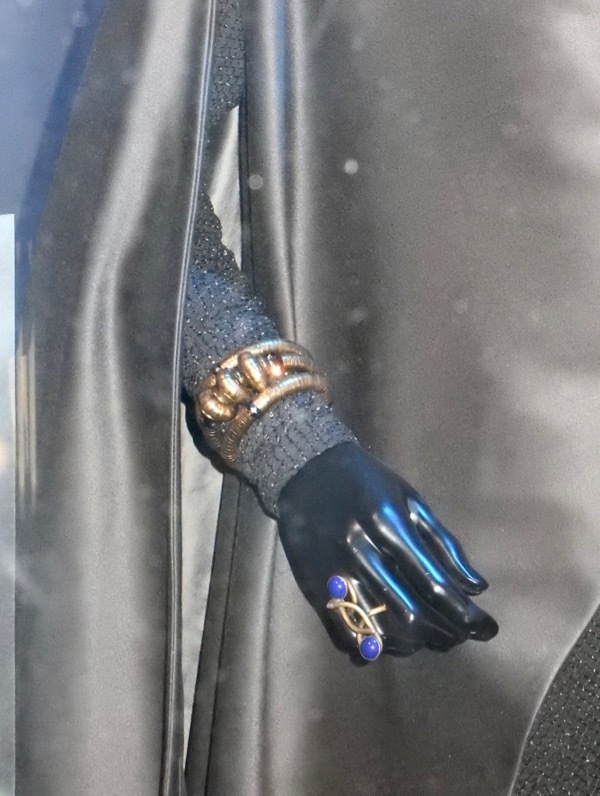 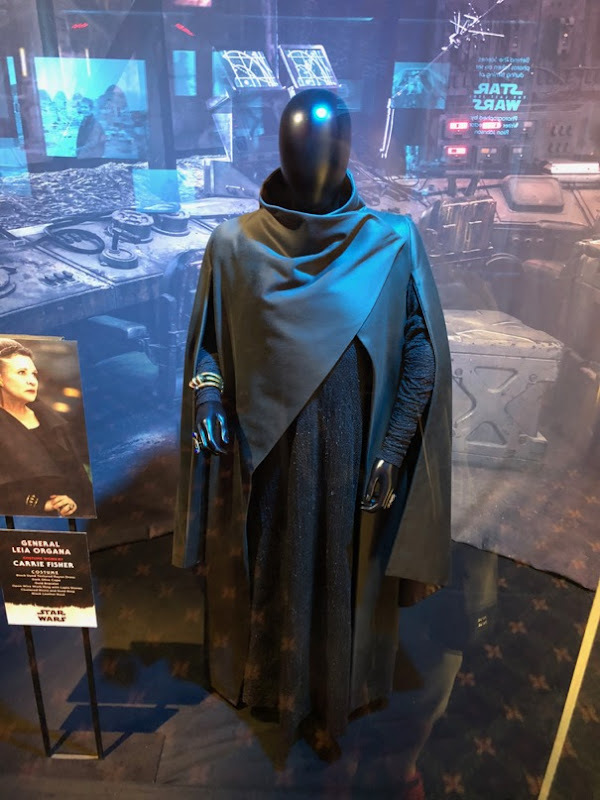 This costume consists of a black dyed textured rayon dress, dark olive cape, gold bracelet and rings and black leather boots. 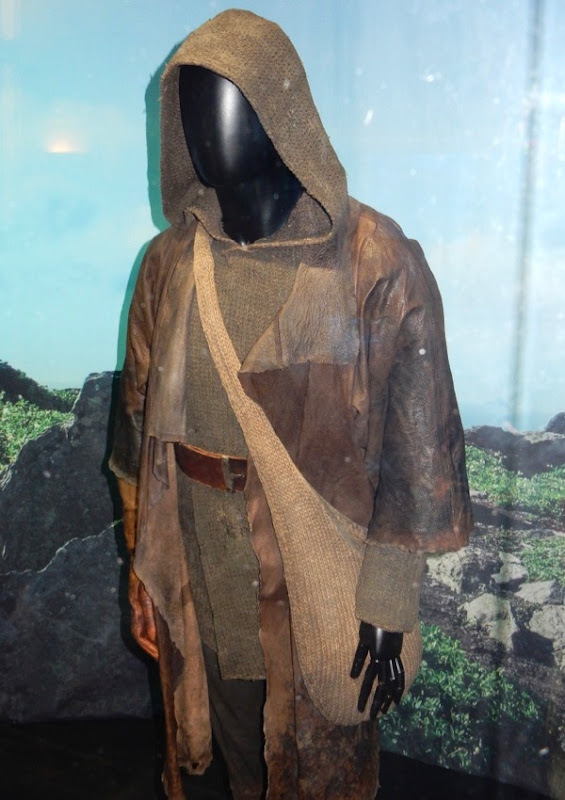 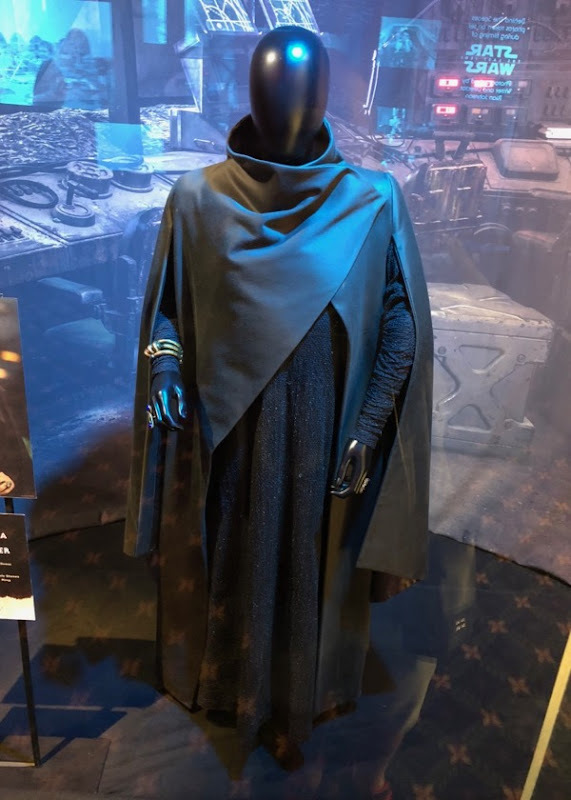 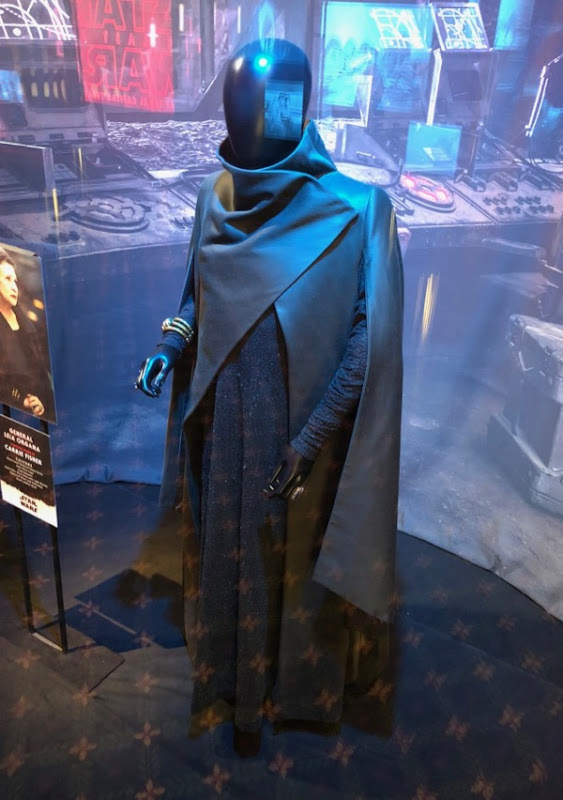 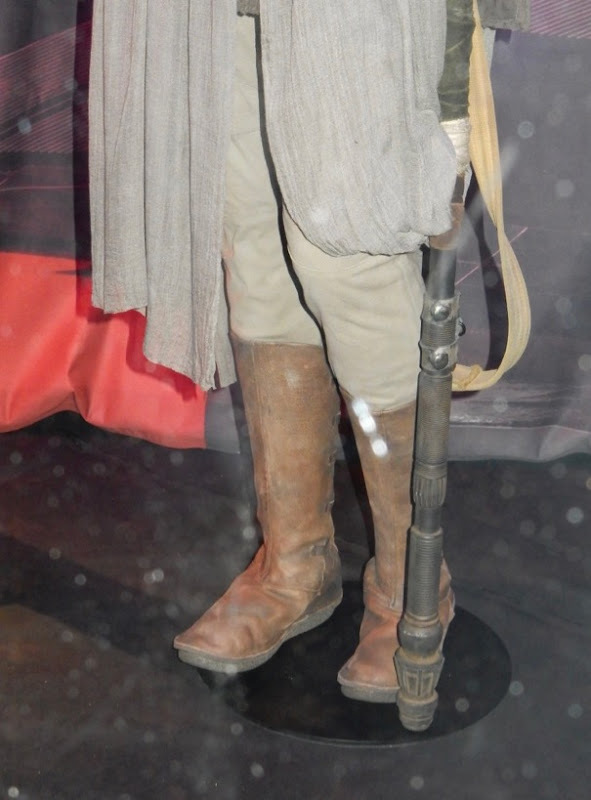 If you like this look, be sure to check out one of General Leia Organa's costumes from The Force Awakens on display. 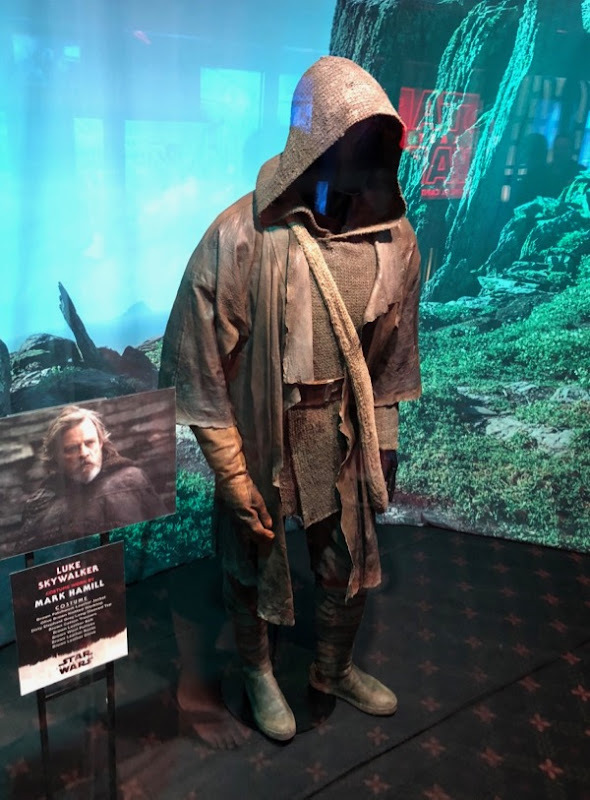 Mark Hamill makes his welcome return as Leia's brother, Luke Skywalker, in this installment and this look is from his hermit-like existence on the island of Ahch-To, home of the first Jedi Temple. 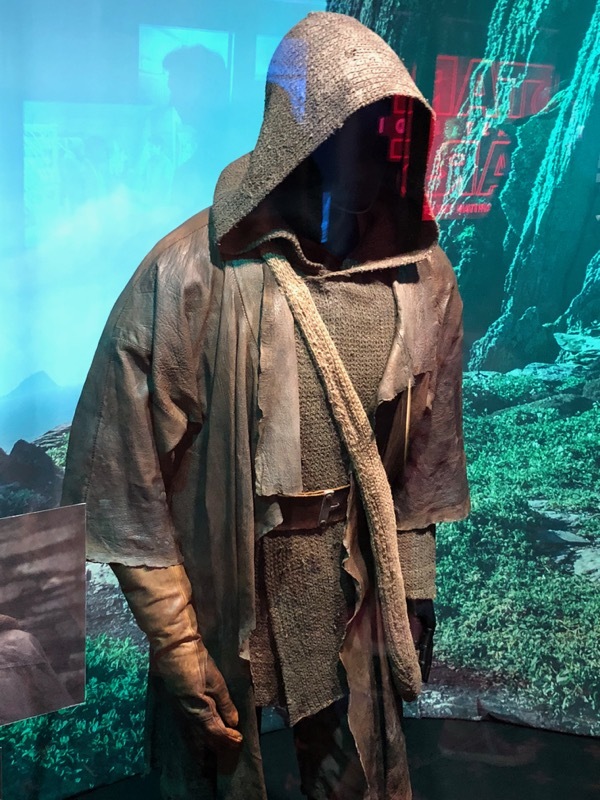 The outfit consists of a brown patchwork leather jacket, olive brown knitted worktop, dirty elephant grey long-sleeved top, brown cotton trousers, brown wool puttees, brown leather belt, boots and one glove for his robotic hand. 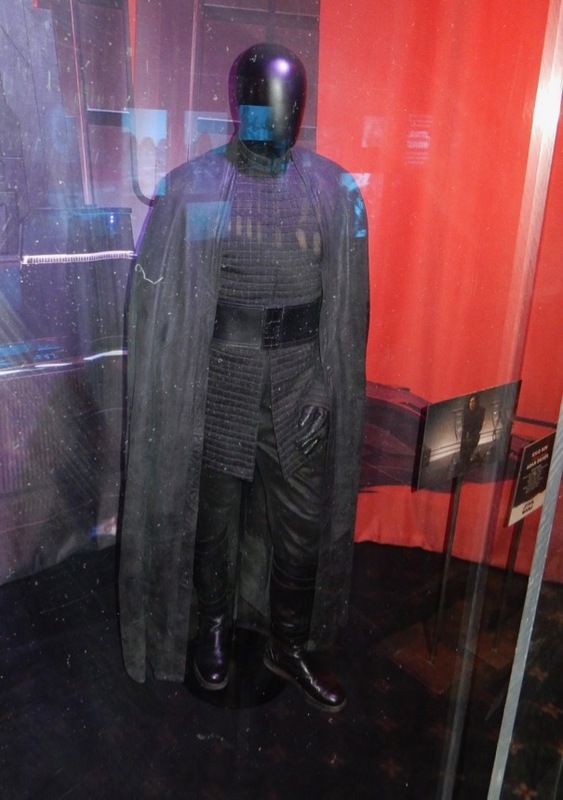 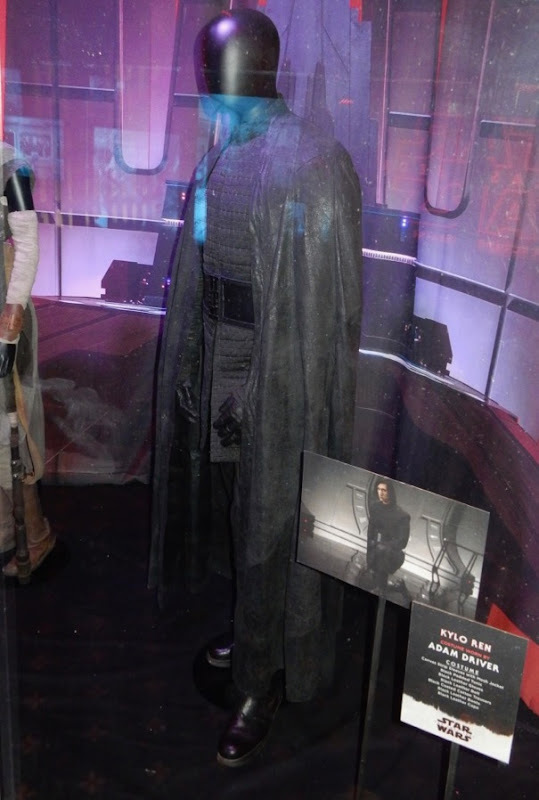 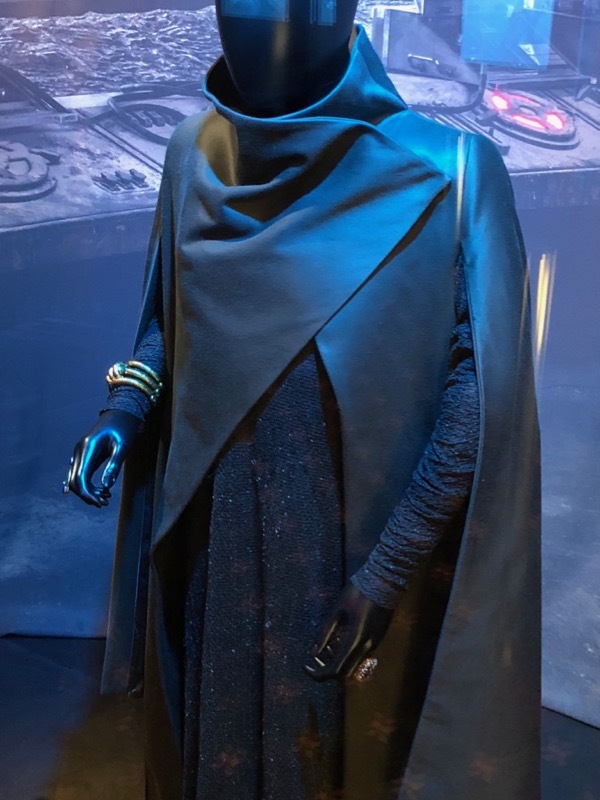 Black costumes are always difficult to photograph, but this costume worn by Adam Driver as Leia's son, Kylo Ren, consists of canvas strip sleeves with mesh jacket, black padded tunic, black leather gloves, belt and boots, black coated cotton trousers and a black leather cape. 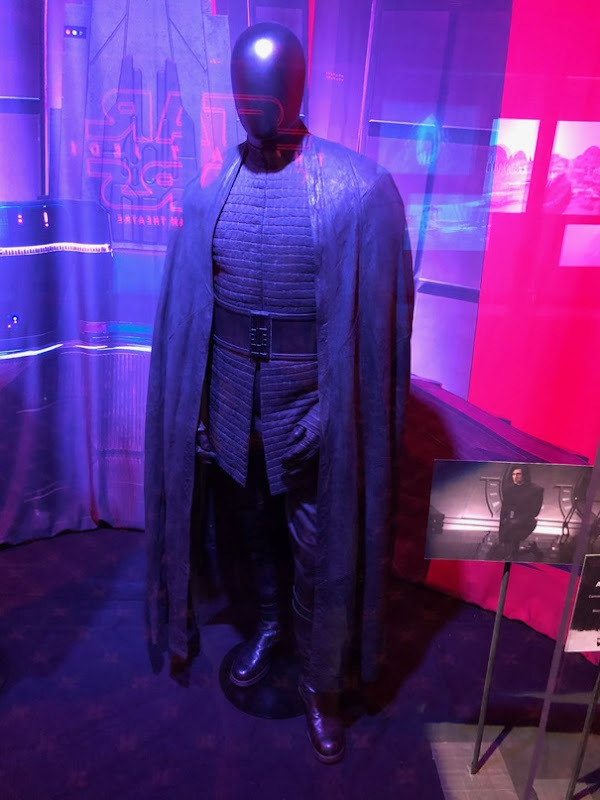 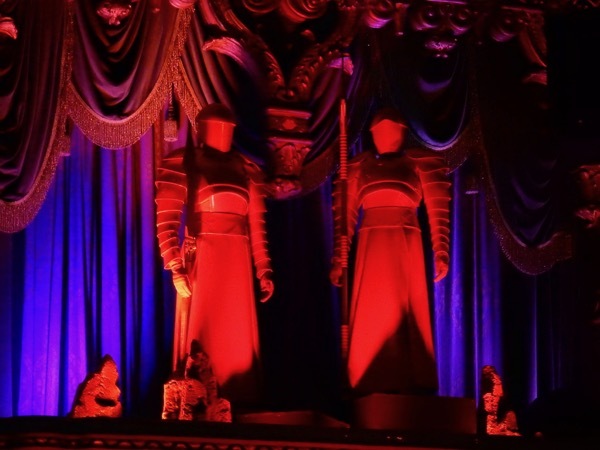 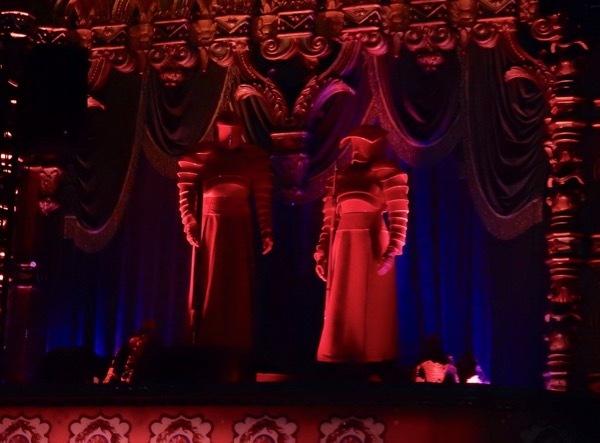 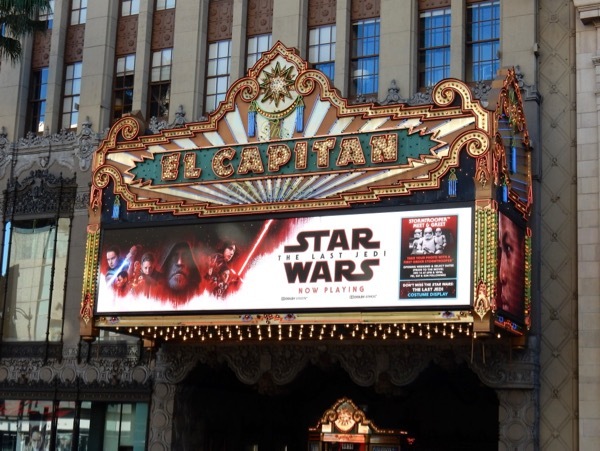 All these original costumes from The Last Jedi were photographed on display at the El Capitan Theatre in Hollywood on December 18, 2017, and in addition to the four costumes to be found downstairs, whilst you see the movie you'll be watched by Supreme Leader Snoke's personal guard in their imposing red armour. 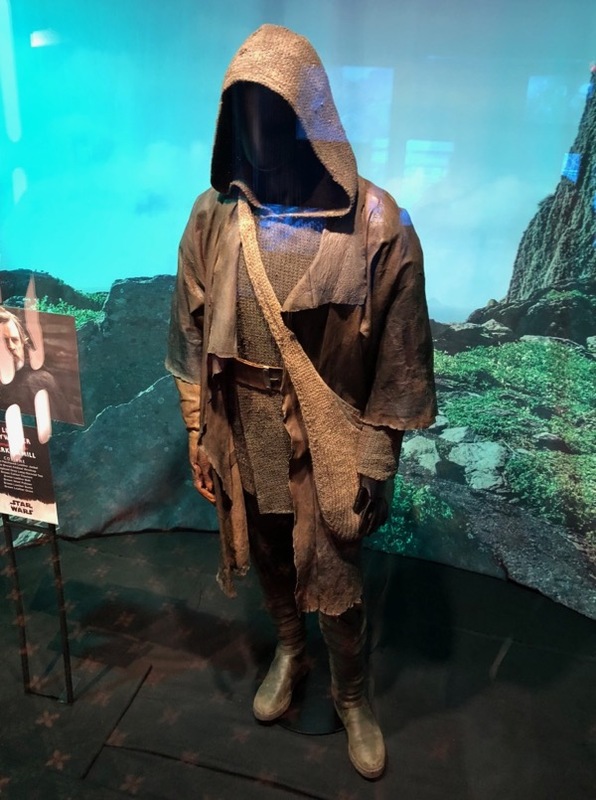 These cool costumes will be on display at the cinema until January 28, 2018, so be sure to check them out in person if you get the chance. 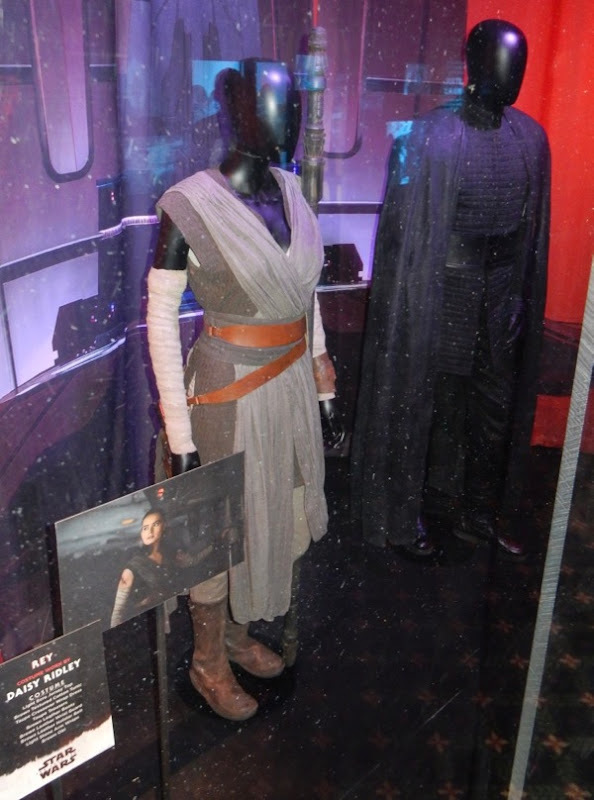 Fans of the legendary sci-fi franchise can also check out these Star Wars: The Force Awakens costumes on display.